In the colder months we definitely tend to do more crafts. I try to ensure they have a tactile side to them just because the kids are not outside, playing in garden and the parks as often as they do in the warmer months, so I always have a bigger need to find sensory activities for them. I also love using recycled items. One of my favourites are glass bottles / jars. I tend to keep all different shapes and sizes and wash them in warm soapy water to get the labels off. Some labels do require a bit of a scrub to come off. This time we combined a bit of left over decopatch / decoupage paper with some scrapbook paper from the site as well as a few of the cutting practice pages. My son opted for animals and cut out multiple images before he eventually selected the monkeys and the fish. 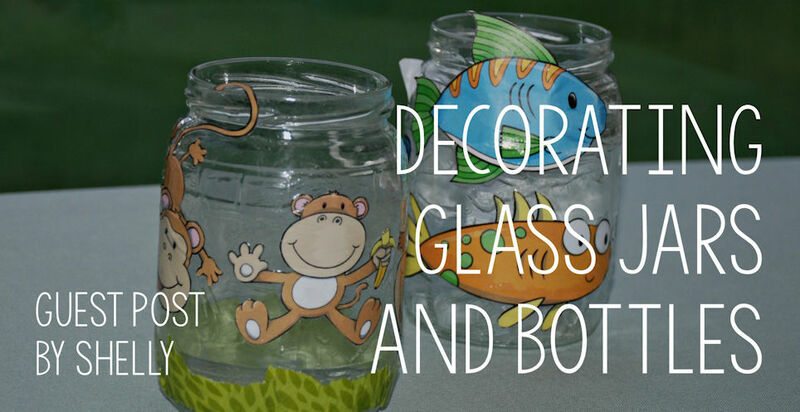 Because the images are going to get stuck down if the kids do cut off a fin or leg by accident you can always just glue to back together on the jar (we have done this a few times and the end result looked perfect). We use Mod Podge glue with our bottles – you can buy it from local craft stores or online. I have used both the matte and gloss versions and they both work perfectly for this type of craft. I like this because when it dries it is completely transparent so the kids can be very messy. In fact I strongly urge mine to paint over the images with the glue to make sure it sticks down properly. I have found this is a case of being very generous with the glue. We also really wanted to test out some of the scrapbook paper and we selected the snowflake design. I have always bought them special Decopatch paper to use so I was interested to see if printing out patterned paper would work as well. We tore the paper into strips and then applied the strips very haphazardly over the jar. The end result was stunning. And if you like tea light candles, we think the bottles looked really stunning at night with some lighted tea lights inside (my night photos really do not show how amazing the bottles looked). Wax resist painting is always a fun techinique to try with the kids and you can get some great results. It helps to have a topic to start with and in our case we were looking at Paul Klee's "The Goldfish" and decided to have a go at our own version. Simple sewing skills and a few moments are required to turn out this pretty fish brooch. We've used a bright orange ribbon to make a goldfish for Chinese New Year, but of course you could use any colour. Make a pretty, glittery, sequin fish with us - it's quick and easy, and oh so pretty on display!